This is an exceptionally accessible, accurate, and nontechnical introduction to quantum mechanics. After briefly summarizing the differences between classical and quantum behavior, this engaging account considers the Stern-Gerlach experiment and its implications, treats the concepts of probability, and then discusses the Einstein-Podolsky-Rosen paradox and Bell’s theorem. Coverage introduces the quantal interference and the concept of amplitudes, and also reveals the link between probabilities and the interference of amplitudes. Final chapters explore exciting new developments in quantum computation and cryptography, discover the unexpected behavior of a quantal bouncing-ball, and tackle the challenge of describing a particle with no position. Thought-provoking problems and suggestions for further reading are included. 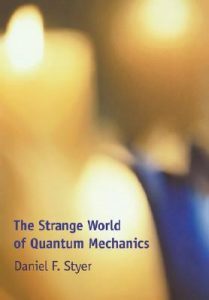 Suitable for use as a course text, The Strange World of Quantum Mechanics enables students to develop a genuine understanding of the domain of the very small. It will also appeal to general readers seeking intellectual adventure.